KENNEDY SPACE CENTER, FL--The Endeavour astronauts, working a deep overnight shift thanks to a two-week launch delay, carried out a detailed inspection of the shuttle's reinforced carbon carbon nose cap and wing leading edge panels Tuesday, a standard post-Columbia check to look for any signs of damage that might have occurred during launch Monday. The astronauts also checked out the spacesuits that will be used for four planned spacewalks at the International Space Station and carried out two rendezvous rocket firings to fine tune the shuttle's approach to the lab complex. 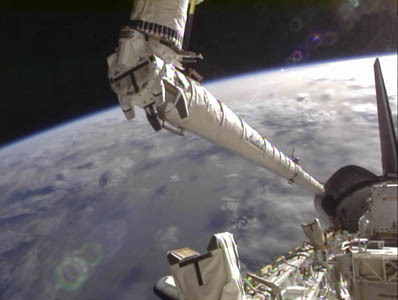 Docking is targeted for 6:16 a.m. EDT (GMT-4) Wednesday. LeRoy Cain, chairman of NASA's Mission Management Team at the Johnson Space Center in Houston, said ongoing inspections and analysis of launch day imagery, radar tracking and sensor data are not yet complete, but "the preliminary assessments that we have is that everything looks really, really good so far, and we're not tracking any issues as far as that's concerned." External tank No. 122 was damaged during Hurricane Katrina when the roof of its manufacturing cell at Lockheed Martin's Michoud Assembly Facility near New Orleans collapsed due to high winds. The tank underwent extensive repairs, but engineers were not able to implement the full suite of post-Columbia upgrades. Before launch, managers said they expected to see more foam insulation losses than usual during Endeavour's launch, but only four such "events," all relatively minor, were noted in ascent imagery. "The performance of this tank really was outstanding," Cain said. "We didn't have but only a few debris events, and the events we had, we believe preliminarily, were less than the allowable in terms of size and mass. So we were well inside the risk we were willing to accept in terms of debris from this tank." The analysis is not yet complete, but so far, there are no obvious signs of trouble with Endeavour's heat shield. "We'll turn our attention toward the rendezvous and docking starting tonight ... with a docking around (6:15 a.m.) tomorrow," Cain said. "So we're very much looking forward to getting back to space station. This is an extremely important mission for us." The primary goals of NASA's next-to-last shuttle mission are delivery of spare parts and supplies to the International Space Station, along with a $2 billion particle physics detector known as the Alpha Magnetic Spectrometer, or AMS. If all goes well, a pallet of spare components will be attached to the space station's power truss a few hours after docking Wednesday and AMS will be attached on Thursday. "They're very excited, they're ready to get AMS safely on board the space station and get it activated," Cain said. "So that's an extremely important milestone for us, not just the agency or not even just for our nation, frankly. A lot of folks around the world are watching intently, and we look very much forward to that activity." With Endeavour's mission proceeding smoothly, engineers at the Kennedy Space Center hauled the shuttle Atlantis, mounted atop a custom transporter, out of its processing hangar for the short trip to the nearby Vehicle Assembly Building where it will be attached to NASA's final external tank and the agency's last set of solid-fuel boosters. If all goes well, Atlantis will be hauled to launch pad 39A starting around 8 p.m. on May 31, a trip that should be nearing completion as Endeavour glides back to Earth around 2:32 a.m. on June 1 to wrap up its 25th and final mission. NASA managers have not yet set an official target date for Atlantis' launch on the shuttle program's 135th and final flight pending an assessment of the launch pad after Endeavour's blastoff Monday. But Atlantis should be ready to go between July 11 and 14. The move to the VAB began at 8:03 a.m. and ended around 1:50 p.m. Normally, orbiters are hauled directly into the assembly building but in this case, managers decided to park Atlantis between its processing facility hangar and the VAB for several hours to give Kennedy Space Center employees a chance to take pictures marking the shuttle program's last "rollover." "It looked great under a clear blue sky with the sun shining off the white blankets," Stephen Clark, a reporter with Spaceflight Now, said in an instant message. "Big crowds came out to see the shuttle leave the hangar for the last time. It's parked outside to let some of the employees stop by for a parting snapshot and see a flight-ready shuttle up close for the last time." Atlantis' crew -- commander Christopher Ferguson, pilot Douglas Hurley, Rex Walheim and Sandra Magnus -- mingled with onlookers, posing for pictures and thanking workers for getting the shuttle ready for flight one last time. For the heat shield inspection aboard Endeavour, pilot Gregory Johnson, Michael Fincke and Roberto Vittori used Endeavour's robot arm to pick up a 50-foot-long extension called the orbiter boom sensor system, or OBSS, that is equipped with a laser scanner and high-resolution camera. Following a carefully choreographed sequence, the astronauts scanned the shuttle's nose cap and RCC wing leading edge panels, which experience the most extreme heating during re-entry. Shuttle Flight Director Gary Horlacher said he did not spot anything unusual in the realtime video downlinked by the crew. "Of course, a lot of the issues that can occur in the RCC are not visible to the eye, so the engineers really have to take a good, hard look at the data once it's on the ground," he said. "But everything looked really good today." Engineers at the Johnson Space Center in Houston will fold the observations into an on-going assessment of launch-day photography, radar scans and data from wing leading edge sensors to assess the overall health of Columbia's thermal protection system. A telephoto inspection of the heat shield tiles on the shuttle's belly will be carried out by the space station's crew during final approach Wednesday, starting around 4:01 a.m., when commander Mark Kelly guides the shuttle through a back-flip known as a rendezvous pitch maneuver, or RPM, that will expose the shuttle's underside to the lab crew. "The data we're collecting today is actually being processed as we speak," Horlacher said. "It will continue to be processed while the crew sleeps, and hopefully we'll get most of that behind them by the time the RPM data becomes available tomorrow. Once all that's in, if everything goes well, we expect to hear initial feedback probably right after the crew goes to sleep tomorrow after the docking." After the heat shield inspection Tuesday, the astronauts mounted the OBSS back on the right side of the shuttle's cargo bay before locking the robot arm onto External Logistics Carrier No. 3, a massive pallet of spare parts and components that will be mounted on the space station's power truss shortly after docking. "A couple of other activities we'll accomplish on flight day two, a couple of the spacewalkers will check out their spacesuits, make sure everything is looking good there and be ready to transfer those over to the space station," Horlacher said before launch. "And then the rest of the crew activities for the day will be checking out some of the rendezvous systems for the (station docking) on flight day three. That'll include centerline camera installation, orbiter docking system ring extension, rendezvous tools check out." The crew began an eight-hour sleep period a few minutes before 3 p.m. Wakeup to begin flight day three is expected at 10:56 p.m.
Kelly, Johnson, Fincke, Vittori, Gregory Chamitoff and Andrew Feustel blasted off Monday at 8:56 a.m., two weeks late because of work to repair an electrical glitch. The delay moved the launch time from mid afternoon to the morning hours, resulting in an overnight work schedule for the crew. The astronauts began their second day in space at 11:56 p.m. Monday, enjoying a recording of U2's "Beautiful Day" beamed up from mission control. The tune was requested by Kelly's wife, Gabrielle Giffords, and his two daughters. "It's good to be waking up in space again," Kelly said. "I want to thank Gabby, Claudia and Claire for that great wakeup song. It's always good to hear U2, a beautiful day in space." Before going to bed Monday afternoon, the astronauts downlinked video from the crew cabin, showing a bit of the work needed to set up the shuttle for orbital operations. Everyone took a moment to say hello to family, friends and flight controllers. "Hey, guys, here we are, Roberto and I, we're on the middeck, we're setting up our water purification system," Chamitoff said to the camera. "We've been in space now for what, four hours, five hours, something like that. It's amazing, we're all feeling great. This is awesome! I can't wait to get back to the space station." Said Vittori, veteran of two flights to the space station aboard Russian Soyuz spacecraft: "My first ride on the shuttle was an amazing launch. I was a little afraid, but I quickly adapted and it's very interesting to work with the shuttle systems. It's easier here in microgravity than it was during the training flow. Most of the equipment here just makes sense, it's very intuitive. Happy to be here." "It was a great ride up, an awesome flight up," Chamitoff said, grinning.